관룡사는 통일신라시대 8대 사찰 중 하나로 많은 문화재를 보유하고 있으며, 경치가 좋기로도 유명하다. 원효가 제자 송파와 함께 이곳에서 백일기도를 드리다 갑자기 연못에서 아홉 마리의 용이 하늘로 올라가는 것을 보고, 그때부터 절 이름을 ‘관룡사’라 하고 산 이름을 구룡산이라 불렀다는 전설이 있다. 대웅전은 원래 석가모니불상을 모셔 놓는 것이 일반적인데, 특이하게 이 관룡사 대웅전엔 약사여래, 석가모니불, 아미타여래 세 부처님을 모시고 있다. 1965년 8월 보수공사 때, 천장 부근에서 발견한 기록에 따르면 이 건물은 조선 태종 1년(1401)에 짓고, 임진왜란 때 불타버린 것을 광해군 9년(1617)에 고쳐 세워, 이듬해에 완성했음을 알 수 있다. 앞면과 옆면이 모두 3칸 크기이며, 지붕은 옆에서 볼 때 여덟 팔(八)자 모양을 한 팔작지붕이다. 지붕 처마를 받치는 장식구조가 기둥 위뿐만 아니라 기둥 사이에도 있는 다포 양식이다. 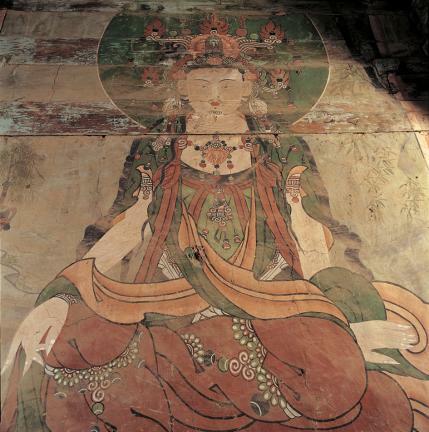 건물 안쪽 천장은 우물 정(井)자 모양으로 만들었는데, 가운데부분을 한층 높게 한 점이 특이하다. 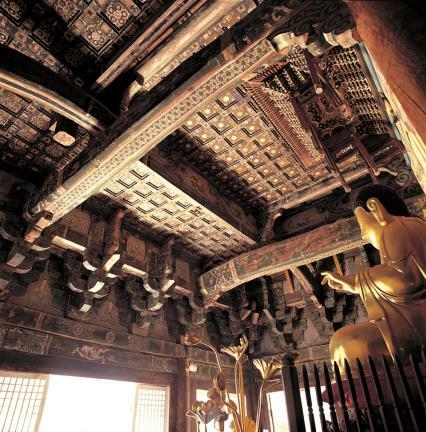 The Gwallyongsa Temple is one of eight major temples of the Silla period located on the middle of Guryongsan Mountain. 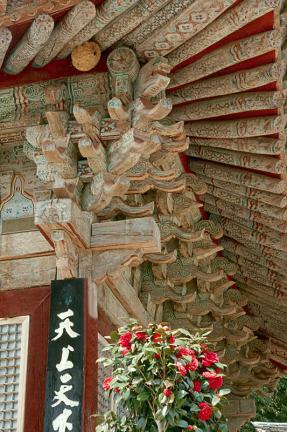 It has many cultural assets and is famous for being set in beautiful scenery. 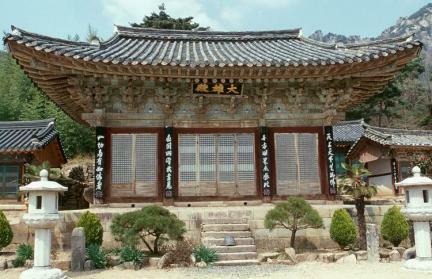 A story has it that the temple was named by Wonhyo, one of the greatest religious leaders of Silla. 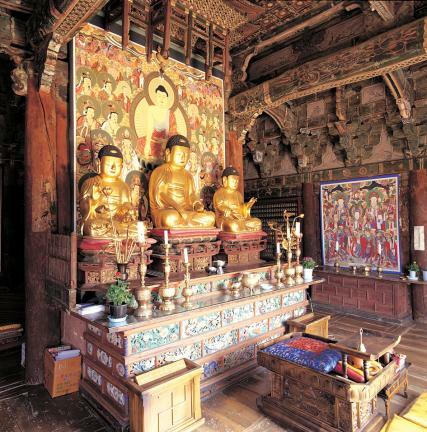 According to the story, the great Buddhist monk and one of his disciples named Songpa were in a 100-day prayer when they saw nine dragons emerge from a pond and soar up to the sky out of pond. 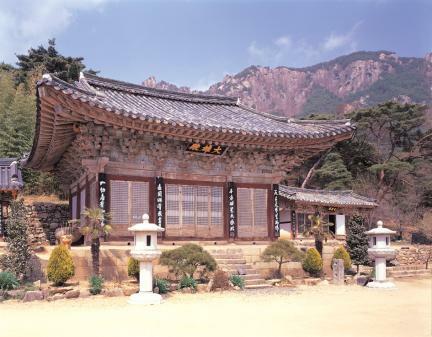 Thus the temple was named 'Gwallyongsa Temple' (which literally means “a temple of dragon sighting”), and the mountain ‘Guryongsan Mountain’ (which simply means the ‘Nine Dragons Mountain’). 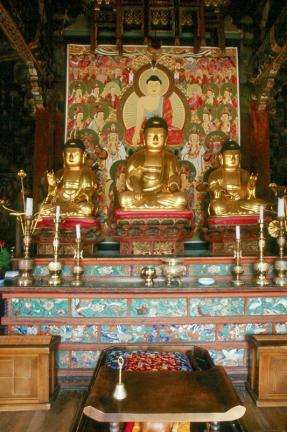 In most Buddhist temples, ‘Daeungjeon Hall’ generally refers to the main hall where Sakyamuni Buddha statue is enshrined, but the Daeungjeon Hall of Gwallyongsa Temple is one of the rare exceptions since it houses the Triad of Bhaisajyaguru Buddha, Amitabha Buddha and Sakyamuni Buddha instead. 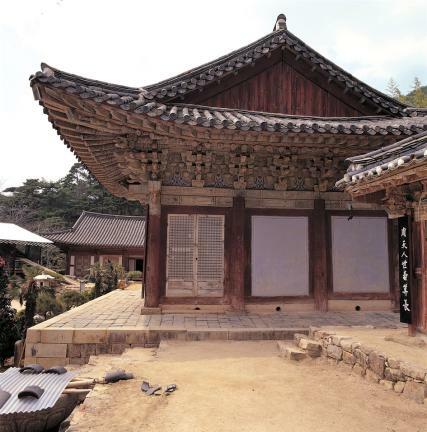 According to a written record found during a repair work in August 1965, this particular building was built in 1401, in the first year of the reign of King Taejong of the Joseon Dynasty, and burnt down during one of the Japanese Invasions of Korea (1592~1598). 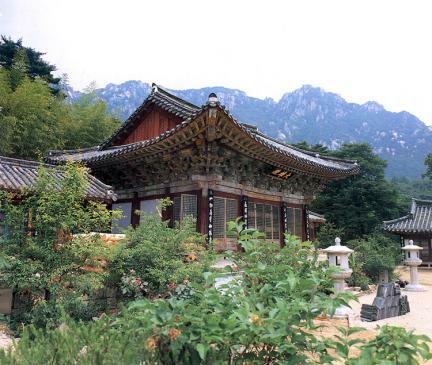 The temple was rebuilt in 1617, in the 9th year of the reign of King Gwanghaegun, and completed in the following year. 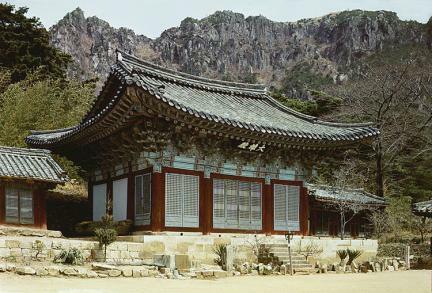 This building measures three kan (a unit of measurement referring to the distance between two columns) in the front and another three on the side under a hip-and-gable roof with its side view is counter-wedged. 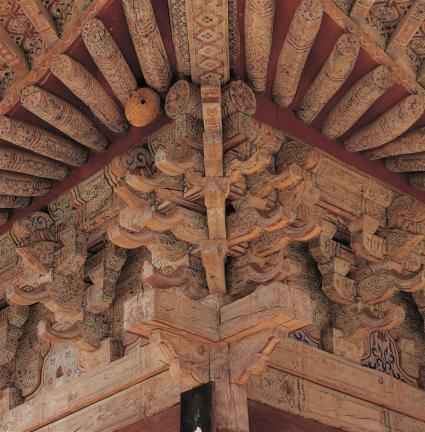 This is a dapo (multiple column-heads) style that has a number of gongpos (the brackets between a rafter and a column) supporting the eaves of the roof across the pillars. 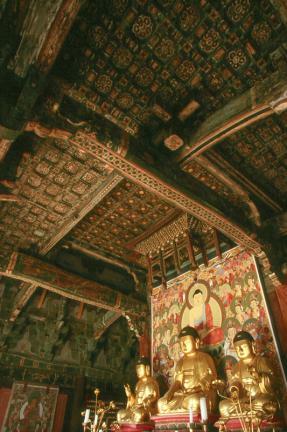 The ceiling is sharp-shaped with elevated center.